In 2005, ICRI opened an office in Nairobi to support larger-scale work in Kenya as well as to serve as a regional headquarters for all ICRI programs in Africa. Over the years ICRI has operated early childhood education, water, sanitation and health, and nutrition programs in some of the most challenged settlements in Kenya. Our current programs serve low-income children in the settlement of Kibera. ICRI Kenya is now working in the informal settlement of Kiambiu to develop a wide variety of child and family projects including the development of a new settlement child and family park, expansion of our early childhood and child health programs, improvement of water and sanitation systems, and utilization of ICRI's locally developed early childhood centers as community center buildings. ICRI operates four early childhood education, health, and nutrition programs in some of the most challenged settlements in Kenya. Our programs serve low-income children in the settlement of Kibera, Kiambiu, Kaole, and Karen. Daraja (or “bridge” in Swahili) was a program that built access to high-quality and developmentally-appropriate early childhood education for Africa’s poorest children. Our Watoto Wonder Bus was a mobile teacher training program bringing expert trainers and innovative materials to schools and child care centers in low-income areas. We provided intensive, on-site, side-by-side training and mentoring. We also provided educators with alternative teaching approaches to engage children and provide activity-driven learning. The GAP project supported grassroots organizations assisting women, children, and families. We provided capacity building, intensive organizational mentoring, networking, and resource sharing to community-based organizations. We also distributed small grants to emerging organizations working at the grassroots level in Kenya, Uganda, and Tanzania. 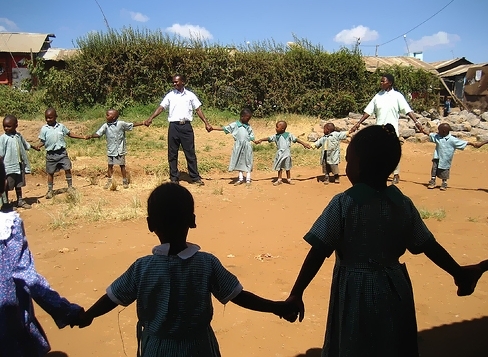 ICRI Kenya developed an innovative, culturally-specific, rights-based child abuse prevention curriculum. We hosted regular trainings for professionals of all disciplines, to build awareness and skills in child abuse detection, intervention, and prevention. We also trained participants in child advocacy and assisted them in developing and implementing child abuse prevention policies in their schools, workplaces, and communities. 12 early childhood programs, serving 700 children, have received intensive early childhood training, materials and support. ICRI has distributed $150,000 in small grants, as well as capacity building and intensive organizational mentoring, to 20 organizations participating in the Grassroots Advocacy Project. 45 child advocates have been trained in child abuse prevention by the KidSafe Project.